For the past few years now, I’ve only been using Himalayan Pink Salt for consumption. It’s my salt of choice. First and foremost, table salt is a super toxic poison, do not consume this internally. It’s easy to avoid at home, but you really need to be conscious of the restaurants you’re going to because most likely that’s what they’re using. Sea Salt use to be my go-to, but nowadays research has shown many contaminants like microplastics as it’s coming from our polluted waters. I’ve heard good things about Celtic Salt, but I’ve never really experimented with it enough to write about it. There are even more benefits of consuming pink himalayan salt then the ones I listed, there’s a ton of info on the web, so don’t just take my word for it. A great way to reap the benefits of salt is to make sole (pronounced so-lay and means energy of the sun) and to consume about a teaspoon every morning on an empty stomach. The only thing I would recommend to do before is coconut oil pulling or your other oral health regiment as toxins build up in your mouth over night so I hear it’s better to spit those out instead of digesting them in the morning. 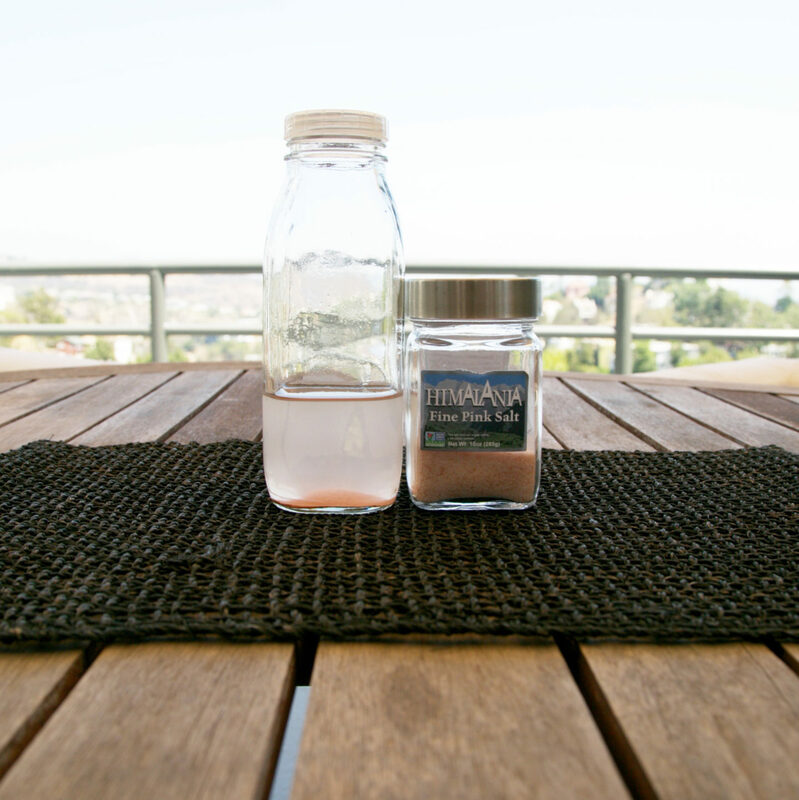 All you need is a glass jar with a plastic or non-metal lid (just save one of your bottled cold-pressed juices), pink himalayan salt, and good quality artesian or spring water. Fill the jar about 1/4 of the way with the salt. Add water to fill the jar, just covering the salt about 2 inches. Place plastic lid on jar and shake gently. In the morning, there should still be some salt at the bottom of the jar (solution becomes saturated at 26%), this means the sole is ready to use. If all the salt crystals have dissolved, add a few more salt crystals to the water. Your Himalayan Crystal Salt Sole is ready when the water becomes fully saturated with salt and cannot hold any more. There should always be salt crystals in the jar. As you use up the Holy So-lay, just add more water and more salt until the water is again saturated. Each morning, before eating or drinking anything, add one teaspoon of the himalayan crystal salt sole to a glass of artesian or spring water, and drink. Keep the container covered to prevent the water from evaporating. No special storage is needed. I keep mine in the kitchen cabinet at room temperature. Sole will keep forever. Salt is a natural anti-bacterial and anti-fungal. It simply cannot spoil or go bad. Do not use a metal utensil to measure or touch the Sole. Sole tastes like ocean water. The first time I drank it was the only time it felt weird. Now, I love it and look forward to drinking it in the mornings! Feed the soul with sole! Your blog is great. Nice content. Thrilled to see you are so much more than a Stunningly Radiant Gorgeous Goddess. Intelligent, articulate, filled with valuable information about truly healthy lifestyle. We have a great deal in common and this field is also my passion. Will read thru the rest of your blogs and somehow force myself to look at your pics. Haha. Be in touch. Be nice to meet sometime since we are decently local.